What Can be Done with Nanotechnology Today? Nanoparticles are so small they contain just a few atoms to a few thousand atoms, as opposed to bulk materials that might contain many billions of atoms. This difference is what causes nano materials to behave differently than their bulk counterparts. One aspect of how nano-sized particles act differently is how they behave in chemical reactions. One of the most interesting examples of this involves gold. Gold is considered an inert material in that it doesn’t corrode or tarnish. Normally, gold would be a silly material to use as a catalyst for chemical reactions because it doesn’t do much. However, break gold down to nanosize (approximately 5 nanometers) and it can act as a catalyst that can do things like oxidizing carbon monoxide. This transformation works as follows. The smaller the nanoparticle, the larger the proportion of atoms at the surface, and the larger proportion of atoms at the corners of the crystal. While in the bulk form, each gold atom (except the small percentage of them at the surface) is surrounded by twelve other gold atoms; even the gold atoms at the surface have six adjacent gold atoms. 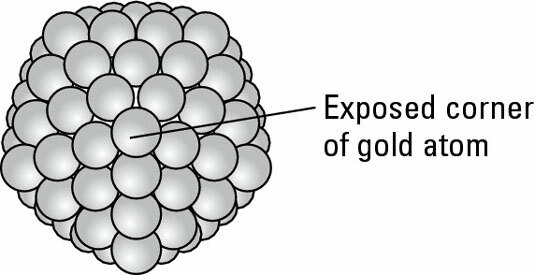 In a gold nanoparticle a much larger percentage of gold atoms sit at the surface. Because gold forms crystalline shapes, gold atoms at the corners of the crystals are surrounded by fewer gold atoms than those in the surface of bulk gold. The exposed atoms at the corners of the crystal are more reactive than gold atoms in the bulk form, which allows the gold nanoparticles to catalyze reactions. It turns out that gold’s capability to catalyze reactions is not the only thing that changes at the nanoscale. Gold can actually change color depending on the size of the gold particles. One of the characteristics of metals is that they are shiny because light reflects off their surfaces. This reflectivity has to do with electron clouds at the surface of metals. Because photons of light can’t get through these clouds and therefore aren’t absorbed by the electrons bound to atoms in metals, the photons are reflected back to your eye and you see that shiny bling quality. In bulk form, gold reflects light. At the nanoscale, the electron cloud at the surface of a gold nanoparticle resonates with different wavelengths of light depending upon their frequency. Depending on the size of the nanoparticle, the electron cloud will be in resonance with a particular wavelength of light and absorb that wavelength. A nanoparticle of about 90 nm in size will absorb colors on the red and yellow end of the color spectrum, making the nanoparticle appear blue-green. A smaller-sized particle, about 30 nm in size, absorbs blues and greens, resulting in a red appearance. Another characteristic that varies at the nano level is the temperature at which a material melts. In bulk form, a material, such as gold, has a certain melting temperature regardless of whether you’re melting a small ring or a bar of gold. However, when you get down to the nanoscale, melting temperatures begin to vary by as much as hundreds of degrees. This difference in melting temperature again relates to the number of atoms on the surface and corners of gold nanoparticles. With a greater number of atoms exposed, heat can break down the bond between them and surrounding atoms at a lower temperature. The smaller the particle, the lower its melting point.